NetGym is designed to help the fitness industry streamline sub communication and encourage team collaboration. Unified sub board and sub schedule, simplifying the entire process for everyone involved. Available on-the-go and at all times! NetGym can be accessed through web, mobile-web, or our native iOS and Android mobile applications allowing for quick access anytime and anywhere! Have more than 1 location? No worries, ask about our discounts! True words from our customers. "Thank you, to your team, for creating a world that has made the fitness world a better place. I am grateful. Everyone should use you!" 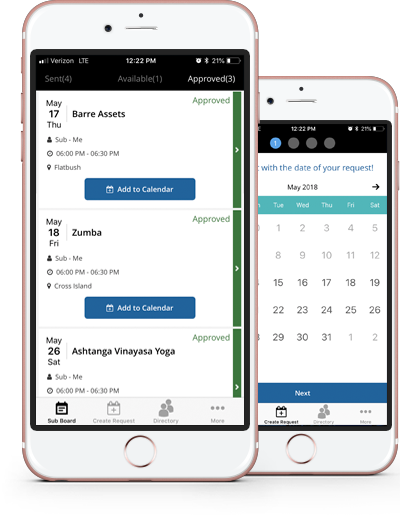 "NetGym helps our instructors nd subs easily and quickly, while freeing up time for our Group Fitness Mangers to focus on key initiatives such as member experience, class innovation, and instructor development." "OMG THANK YOU so much NetGym! I just tried to call you and say how smoothly the first day is going. NetGym is so BadA$$. LOVE IT!" "It's been about 20 minutes of me using it and so far I LOVE NETGYM! This is fantastic." "I am absolutely loving your software. This has been such a game changer and I couldn't see myself managing without it." "NetGym has been a life changer I use it all the time (hence why I was worried when I wasn't receiving text) I'm able to sub at any YMCA gym and it helps me connect and work with a lot of people. NetGym was a brilliant idea." "I would recommend NetGym to any studio! This program makes the sub process simple and easy. I love seeing the calendar in our portal to see who is subbing during the week at the studio! Thank you, NetGym!." "We really appreciate this system. I think it is going really well. One great aspect of this system that we didn’t anticipate is that our instructors are able to make more money because sub requests are opening up to them that they would not know about otherwise. Thank you for all of your hard work!." "I make all of the schedule changes for the team on MindBody, and I must say that NetGym has been such a time saver! I don’t know how I lived without it!." Are you interested in NetGym? Get a 21 day free trial. © 2019 NetGym, All Rights Reserved.